How can I reuse or recycle meat bones? | How can I recycle this? How can I reuse or recycle meat bones? Can I compost bones, free from the butcher? In the vast, vast, vast majority of cases, this would be a big no – the smell of any left over meat or marrow would probably attract unwanted vermin, they could introduce/encourage dangerous organisms which might not get broken down in the composting process and depending on the thickness of the bones, they could take an age to rot down and clog up your heap in the meantime. But what else can be done with them? Any suggestions? Of course the great recycler of all: Give them to your dogs. If you don’t have one adopt and you will never throw away any scraps :) Also, if you don’t like dogs then get chickens. Chickens will peck every bit of meat off then the bones can compost in their pen. Plus they will give you a nice egg in return. Cooked bones are brittle and can leave bone splinters in a dogs mouth ( I have a vet friend who’s main dog clients have suffered from this problem) so please don’t feed them to your dog. But uncooked bones are all natural for your animals. Don’t let anyone tell you to not do something that sounds like a useful idea, look into it yourself, but don’t take there no for an answer. Is no one seriously going to comment that it’s a little fucked up to feed chicken meat to chickens? If you were really concerned about the environment, you probably wouldn’t be eating meat to begin with. Anyone who lives in a first world country (or is lucky enough to live the lifestyle) has absolutely no right to make such a comment. Doing so is hypocritical in the extreme. This sharp-tongued comment shouldn’t be welcome. =S This person’s trying to help the world just like we all are. Any bit of help or attempt to do so should no go underappreciated. I suppose that eating/drinking soy products that use imported soybeans, and also require water to irrigate, with sediment-laden runoff draining to creeks, energy to produce and transport, and wrapped in unrecycleable packaging is better than eating locally raised, free-range, organic meat. Oh dear, if YOU were really concerned about the environment you wouldn’t be breathing all that oxygen! I eat meat. But displays of a fine dish of sanctimony makes my mouth water for Ben. surely that depends on how the meat was produced and what you’re comparing it to. Was it an animal which ate leftovers? Did it do other useful work during its lifetime? Was it a wild animal that you hunted? If you’re comparing it to vegetables, were they flown in from Israel? Were oil based fertilizers used in its production? Was it sprayed with pesticides? If you were *really* concerned about the environment, you probably wouldn’t be using a computer and accessing the Internet. And if you were paying attention at all, rather than trolling unhelpfully, you’ll have noticed that there was no mention of eating meat, just composting bones *free from the butcher*. Sure, veggies may be flown in from far. I try to buy local when I can, or at least from the same continent. Regardless of this, meat production uses up to 7 times the amount of land as a vegetarian diet. Sure, I admit to trolling a bit, since it did not explicitly say that the meat was being eaten. It is an important issue though, so it deserves to be brought up when the chance arises. At least you’re admitting to being nothing more than a pathetic comment troll. Better than most of ’em. Boiling them with onions and a mixture of spices will give you a great soup stock. Just let it simmer on low heat on the stove or even in the oven. Not only will the meat fall off the bones, you leech most of the marrow out as well. The stock can be used for soup, stew, gravy etc. I just tried this very thing. The bones and any bits on them where first put in the oven to get crisp and very brown. (300 degrees for about 2 hours) Then I placed them in a large boiling pot of water with a scraped carrot, stalk of celery with the leaves still on, 1/2 an onion with a clove stuck in it, a bay leaf and 8 whole peppercorns and a two stalks of raw broccoli. WOW ! after simmering for an hour the stock had a robust flavor compared to standard chicken stock. I can’t wait to try it in some dishes. In very old time, they used to carve chicket bones to make buttons for clothing. You need to clean the bone very well and then cut it and carve into the shape you want. now you are talking serious business. how about carving out those african necklesses, bangles and the like. aint we headed for stoneage anyway? you dont have to kill or eat animals throw papers to the trash can , you have to put in recycle to they were more papaers and aluminions , bottles etc. The exception to the bones to animals rule is if the bones haven’t been cooked – they are fine. If you want to keep bones, there are two ways that I know of to clean them – maggots (quick if icky) and burying them (takes ages but tends to give a ‘natural’ finish). When I was a kid, we had a pet dog. Our vet told us not to give bones to the dog, because bones splinter. So we pressure-cooked the bones until they were soft and the dog ate them all up, with relish! This seems a good solution, doesn’t it? Art….try to fit the bones together to make them look like a full sceleton glue the bits together put them on a stand and there you go. You can put meat bones (and meat cheese etc) in a ‘Green Cone’. A sort of composter that seals in the smells that attracts vermin and uses ground worms to breakdown any food. I guess a wormery might also be able to cope with bones. 2) Cleaning the bones is best done with a) teeth, if there’s any meat-eaters in the house, then b) an old toothbrush + a blunt knife (don’t scratch the bone! ), then c) toilet bleach in a shallow tray overnight. Any cartilidge will stink and decay, so get it all off. 3) Coat with clear nail varnish for a tidy finish. 4) It’s probably best to super-glue the jewellery (lengthways onto an earring hook, the top of a hair-comb, a plain hairband), as piercing can cause it to splinter. It should still be secure. use them to make soup, my dad does that tastes really good. ya, bones flavor soups really well, I’m from the south we do that all the time. I’ve tried it & it works great as long as you don’t put too much vinegar. bury them in some sand in your yard. the local insects will pick them clean, then bleach in the sun for a couple of weeks. the result is beautiful white bone that you can carve. I boil, bleach, and then make necklaces and jewelry out of them. even though you cant get me within a mile of meat of any kind, i do know you can use the bones (w/ a little meat attached) to make broths & soups. bones for furniture please explain? I give my dog bones from butcher shop or store and after he is done, I’d like to recycle them some how. You CAN compost meat and bones without smell -Google livestock composting which as a much better practice than incinerating carcasses. You need lots of carbon and time – not sure if you could easily do only bones… Entire cows can be completely gone in 6 months. Also if you have the facilities to do so, grinding them would be great for compost pile or direct to garden. Ever heard of Bone meal? I would probably cook first to kill pathogens if not putting into a hot compost pile. This is something that I am going to try someday – making bone ash as a pottery ingredient. I think if I put bones in the kiln with an already fired pot the ash left may actually be usable. If a limited amount, you could try neutralizing them in an acid bath (strong vinigar) until the proteins are broken down – surely they would compost better at this point. Be Sure to dilute and use the old vinegar on the heap too! Thank you Steve for this answer, it was really frustrating reading so many variations of the same comments until finally someone suggests bone meal and to google livestock composting. Well here’s an update if there’s any interest. I’ve just bought an acme mincer, the old fashioned type which clamps on to the worktop, and is made of cast iron. Will that do boiled chicken bones? I’m about to find out. I cook all bones (beef, pork and poultry) down for soup stock. If cooked long enough they are very soft. Then I put them in my dehydrator until they are thoroughly dry. A few whirls in the blender gives you a very fine bone meal which can be used in the garden or incorporated into home-made cat, dog or chicken feed. Many thanks, by dehydrator do you mean oven? I think I havn’t been boiling the bones for long enough, so this time the chicken bones are going on the simmer for a lot longer perhaps a couple of days, although I must not forget them! I’m sure there is a way, and you may have it! dehydrate for y amount etc. I am not responsible for your blender etc. After boiling bones for stock I put them on the (wood ) fire; they soon become brittle enough to break down and provide bone meal with the wood ash for the garden / compost heap. Many thanks to Steve and the helpful lady I’ve been conversing with. Your suggestion re vinegar Steve was helpful I put a small amount of cider vinegar in the boiling broth and I cannot taste the vinegar but it does seem to have softened the bones, along with giving them an extra boil for 2 days rather than one. this chicken was an organic one, so the bones were very hard to start with. Apart from the long bones all the others have crumbled by hand, and I have no doubt all the bones will now grind to a clean powder, and hopefully I can feed it to my worms. I shall tentatively try grinding the long bones in my spice grinder, if it doesn’t work, it’ll go in the cast iron acme grinder winging its way through the post. I think the mix of wood ash and bone meal is an excellent one, and if you have a garden it’s probably the best way, alas I’m in a flat, so everything has to be done in the home. I think we’ve cracked it though, so thank you Steve and the anonymous lady. I second what Steve said: You CAN compost meat scraps, bones, dairy products, ect….. The basic rule of composting is “if it is organic (used to be alive), it can be composted”. I have been composting EVERYTHING that comes from our kitchen for years now. Left overs, thanksgiving turkey carcases, steak bones, spoiled pot roast (was left out on the counter overnight-oops! ), including all my waste paper products. I put it all together in a 55 gallon steel drum and let it “cook” untill it’s too full to turn, then empty all of that into my existing garden compost pile, mix it up and when it ready, it all goes into the garden as a lovely, rich soil conditioner loaded with all kinds of mineral, nutrients and humus. I haven’t had the aweful smells people talk about because I mix in LOTs of shredded paper with each batch and keeping it in the steel drum avoids problems with the “vermin” (except for the normal house flies – however, the drum is far enough away from the house to not create a problem with that). oh- by the way, the bones do compost after a year or so in the pile. Just leave them in until done. Yes Shawn I absolutely agree with you, regarding everything organic, and the Machynlleth Centre recommend it. The only addition I have is to put garden lime in the mix, to speed the process up, and keep the mix sweet, however with the addition of paper and cardboard, the mix may well stay sweet anyway. My problem has been that I no longer have my garden, and can’t bear to throw away all that lovely organic potential. So I’m kitchen composting, with securely fitting lid containers, you can buy them on e-bay, allowing the mix to cook a bit, this let’s all the unpleasant flavours the worms don’t like to leach out, (oranges and onions) and the mix actually goes warm, so nature is still taking its course. Then it’s a feast for my little wrigglers, who love it. I’ve had a problem with chicken bones, but as I’m now looking at a tawny coloured powder that used to be carcass, I think I’ve cracked it. 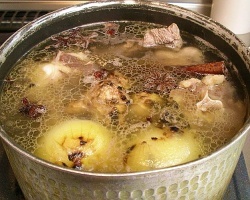 Boil the chicken with the meat on first, to remove all vestiges of soft tissue, this includes connective tissue, cartilage, ligament and tendon, it all melts down in the broth and provides a lovely jelly. I boil the clean bones for 2 days, with about a dessert teaspoonful of cider vinegar in the broth. (the vinegar does not taste by the way, you can still add lovely veggies like celery, onion and garlic, and have a nice stew.) The vinegar leaches out the calcium it would seem because after the bones have been dried, try on the radiator, saves energy, but you may have to use a very cool oven. I found most of the bones except the long bones can be crumbled by hand. The long bones obligingly gave up the ghost in the spice grinder, but rather than risk expensive kitchen equipment, it may be as well to get an old fashioned acme cast iron grinder that we used to mince meat with years ago, I’m fairly sure that’d do it! That’s it I’m finished! Many thanks for hints and stimulating conversation. I used to give pork bones to my hamsters to munch on, keeps their teeth from getting overly-long. So, here we go again, right where I left off, this time I’ve cracked the large bones problem also. 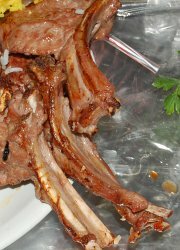 I put all large bones, recently, some goat spine and long bones in the pressure cooker, and cooked them for 2 days. The result was very soft bones that crumbled easily with a small amount of pressure, my friend put them in a strong polythene bag, walloped them with a hammer and fed the resulting bone meal to the ducks! Good all round, we get a good feed also! Hello everyone, thanks for all your input. I find them informative, well most of them. i always make stock with my bones and want to start trying to grind them for dog food or gardening, but wonder if they are soft enough to grind does that mean all the minerals have leached out making them essentially useless for nutrition for dog or garden. Will try all these tips as well to avoid throwing them away. Thanks for some great ideas! Thanks so much for this info. I do not want to throw bones in the trash. For the same reason not to feed to my dog, I would not want a wild animal to somehow find it. I have been cooking this darn ham bone for hours now, just about torched my favorite pot, very easily distracted. I will now try the pressure cooker and grinder method. Hard to find info. Save your bones up in a bag. Start a small fire with sticks and burn them up. They burn very easily in minutes. I use an old grill out of the trash. Dump the ashes in your garden. All the minerals are still there. The charcoal from the sticks is also good for the soil. No rodents, no smell, no mess. 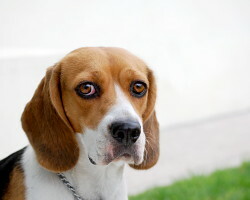 Bones are fine to give to dogs if they have been well-boiled (or pressure cooked as already mentioned) until they are soft. I always use bones to make stock, which softens them up, and then I give the soft, smooth bones to my daughter for her dog. Nobody mentioned it, but do you know that paint is made with bone powder?